Courtesy of Cajun and Zydeco Photos, David Simpson. A color reproduction of a photograph of Alphonse "Bois Sec" Ardoin. 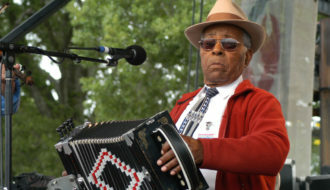 Accordionist and singer Alphonse Ardoin, better known by the nickname “Bois Sec,” helped define zydeco and Cajun music. In a career that lasted more than fifty years, he frequently played with fiddler Canray Fontenot, performing as the Duralde Ramblers. The duo performed at the Newport Folk Festival in 1966, after which they recorded their first album. Twenty years later, the duo won a National Heritage Fellowship from the National Endowment of the Arts, an honor given to folk artists who preserve and/or perpetuate traditional culture. In later years, Ardoin recorded with Cajun fiddler Dewey Balfa and played with a variety of younger performers. Alphonse Ardoin was born November 16, 1915, in l’Anse de ‘Prien Noir (Black Cyprian’s Cove) near Bayou Duralde, Louisiana. Duralde is an unincorporated village between the towns of Mamou and Basile on the southwestern prairies of Louisiana. Within Duralde are a number of anses (coves) or small settlements. Family history suggests that Ardoin’s great-great-grandfather, Cyprian, settled in the area in the 1830s. The family has lived in the village since then. For many years, the Ardoin family sharecropped fields, raising rice or soybeans or using the land for grazing, depending on the year and season. Ardoin’s nickname, “Bois Sec” (dry wood), was given to him as a child because, he said, he was always the first to the barn when a rainstorm interrupted work in the fields. When Ardoin was about two years old, his father died. His mother took a job doing laundry for a white family to earn money. Ardoin’s older brother hired himself out to help support the family. When Bois Sec was about seven, he started to take his older brother’s accordion and hide in the barn to practice. The young Ardoin didn’t realize that his sound carried, and one day he got caught. “I didn’t know that when you’re high up, you can see far, but the sound carries far as well,” he recalled. But his brother was impressed and, instead of getting angry, gave him permission to keep using his accordion. 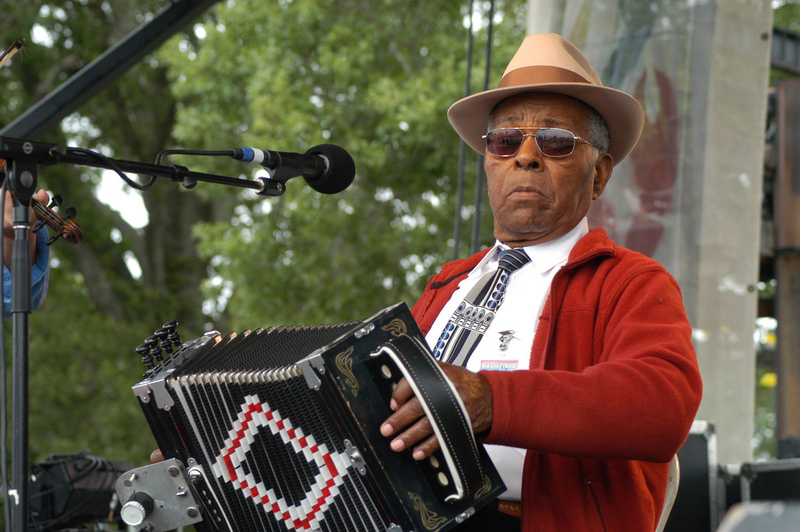 The music Ardoin played is often called zydeco, and it blends Cajun, African American, and French Afro-Caribbean sounds and rhythms with fast tempos, frequent syncopation, and blues tonalities. The button accordion, the violin, and the frottoir (rub-board) were central instruments in early bands such as those of the Ardoin family. Ardoin’s brother, Delphin, known as “Phin-Nonc,” was an accomplished accordion player, but performed publicly only on Mardi Gras. Three of Ardoin’s sons played accordion at various times in the family band. Gustave “Bud” Ardoin played with the band until his death in an auto accident in 1974. Ardoin’s oldest son, Morris, filled in after Bud’s death. Morris plays the piano accordion and the smaller button accordion. He played with the band for a while before leaving it to run Club Morris, the family dance hall and bar near Bois Sec’s home. The club is the focal point of social life for the entire Duralde Creole community. It is there that the family band, which usually included Canray Fontenot, played for dances every two weeks. Ardoin’s youngest son, Russell, plays bass for the family band. Alfonse “Bois Sec” Ardoin died in Eunice on May 16, 2007, at the age of 91. National Endowment for the Arts "Bois Sec Ardoin." In https://64parishes.org Encyclopedia of Louisiana, edited by David Johnson. Louisiana Endowment for the Humanities, 2010–. Article published April 12, 2011. https://64parishes.org/entry/bois-sec-ardoin. Ancelet, Barry Jean, and Elemore Morgan, Jr. The Makers of Cajun Music. Austin: University of Texas, 1984. 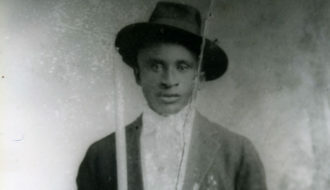 “Influential Creole Musician: Alphonse Ardoin.” Contemporary Black Biography: Profiles from the International Black Community, Vol. 65. Detroit, MI: Gale, 2008. Jennings. D. “In Bayou County, Music Is Never Second Fiddle.” New York Times. Nov. 22, 1998, pp.37–8. Le Menestrel, Sara. “The Color of Music: Social Boundaries and Stereotypes in Southwest Louisiana French Music.” Southern Cultures 13, no. 3 (Fall 2007): 87–105. Spitzer, Nicholas R. “Monde Creole: The Cultural World of French Louisiana Creoles and the Creolization of World Culture.” Journal of American Folklore 116, no. 459 (Winter 2003): 57–72. Tisserand, Michael. The Kingdom of Zydeco. New York: Arcade, 1998.